The propensity of new business models to trigger the creation of new roles in Human Resources is immense. 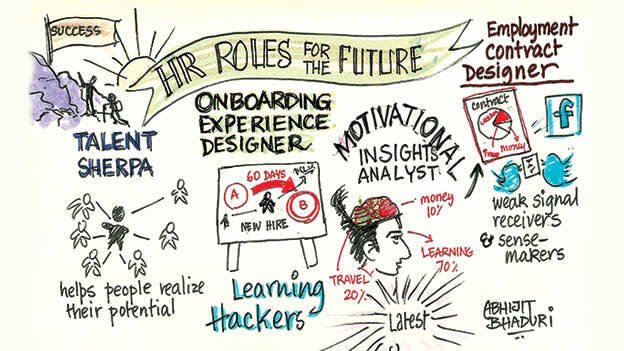 Let’s see what roles can be crafted for the future HR! I was one of those movie buffs who waited eagerly for Netflix to launch in India. Recently a colleague shared on WhatsApp that we could sign up. A friend who has made a film texted me to say that his film was one of the earliest ones that Netflix picked up to add to its library. As I signed up on my mobile, Netflix showed me a set of movies and television serials and simply asked me to choose three that I liked. That gave them perhaps a fuzzy idea about the kind of movies I would like. Their recommendations get tweaked and fine-tuned as soon as I click on a title or when I abandon a film half-way. Every action of mine is a data point that gets thrown into a big cauldron of data that Netflix will keep adding to its kitty to recommend movies that I will find compelling. Imagine having that model play out in the workplace. The Talent Acquisition team looks at your skills and passion and crafts a role that really gives you a buzz. Every day, based on what you enjoy doing, the next set of tasks are added to your plate. Or you choose three skills you want to build. Based on that the L&D team shows you a set of YouTube videos you can watch, a set of MOOCs you can take – all beginning on different days. As you keep making your choices, the app tells you about all the courses that are trending, the courses that your friends are taking and creates a leaderboard that tracks the percentage of readiness for possible roles that you may have a chance of succeeding at based on talent analytics. I could use the Netflix model to choose the benefits package in the same way. Or imagine the organization to provide me someone like a relationship manager or wealth manager who can advise me on how to make my salary go further. Or have a wearable that sends me a negotiation tip when it picks up from my calendar that I am bracing myself for a negotiation meeting. Many organizations will start experimenting with new roles in HR that are more specialized and nuanced. Here are a few roles you could craft. Talent Sherpas: They will be experts in employer branding and will have a powerful presence in all the talent communities. They will be the evangelists for an organization’s culture and will be able to craft winning proposition for the candidate as well as the organization. The Talent Sherpas will have a way of understanding the skills and learning capabilities of people and can suggest roles that help the candidate to realize their potential. They know the internal candidates just as well and can help develop and retain the internal talent pool. Onboarding Experience Designer: Organizations hire people. Yet there are not enough people who know how to onboard a new hire. And by that I don’t mean giving them office space and a laptop. Onboarding happens when a new hire feels mentally integrated and contributes to the role as was expected when he or she was hired. Designing an onboarding experience is like being an instructional designer. It is about sharing the tips and nudging the new hire to navigate through the culture while making new connections and getting buy-in on the expectations of key stakeholders. Definitely a task for a designer. Motivational Insights Analysts: The Deloitte Human Capital Trends of 2015 says that more than twice as many employees are motivated by work passion than career ambition. Yet we know that motivation is a deeply personal process. Two people doing the same job could be motivated by two different needs. These analysts will be able to shape the role, the total rewards system and the feedback process in a manner that makes it meaningful to the employee. It is surprising that we have left the important business of motivating employees to people who usually have no special training in this field. And yet we expect people to stay motivated. Employment Contract Designer: More and more professionals are becoming available through apps. Working models are changing. The pay-per-use model is giving rise to terms like 1099 workers (in US) which refer to those workers who are offering their services to companies (like the Uber drivers) as contrasted with W2 workers who are permanent employees on the rolls of the employer and who get benefits like paid time off etc. Every country has different employment laws and as new employment formats evolve, so will the levels of complexity. The employment contracts are going to get more complex and will need someone who knows employment law and works with Talent Sherpas and Motivation Analysts to create employment contracts that are in line with the evolving models of work. Learning Curators and Hackers: Changing business models and regulatory environments need people who can pick up just the right amount of knowledge in time to translate it to the task at hand. Learning curators will be able to quickly understand the knowledge and skill gaps that are barriers to performance. The curators will be able to create byte size modules of information and hack the best way to learn complex information and skills. This will need skills of personalization of the content because people have differing learning styles. Weak Signal Receivers and Sense Makers: In a world where speed is everything, the ability to pick up early signals makes all the difference. Many of these signals are bubbling up in conversations on social media. Senior leaders often complain of feeling overwhelmed by the amount of information they have to consume, make sense of and react. Having someone who can listen to those signals and only cull out what is relevant for the leader to react to is imperative. Very often this means connecting apparently unconnected pieces of information. This needs someone who understands the strategy of the firm and uses that to filter the signal from the noise. Traditionally, organizations have worked based on one rule that every employee of the organization had to follow. Then came the era of five or six sets of rules that applied to five or six types of employment contracts that were offered by an organization. What if each individual employee had their own unique contract based on all the possible variables they could choose from. Today, several startups and digital disruptors have very few employees. For example, Uber has a policy of having only 3 employees in a city who manage the entire operation from partnering with drivers and managing them and serving clients. Xiaomi sold a million handsets in in India with only 75 employees. Will these organizations create new models of performance management and rewards? Will they grow their own talent by hacking new ways of learning at a rapid pace or will they buy out talent on a pay per use model? The possibilities are immense. As new business models appear, it will trigger the creation of new roles in Human Resources. What do you think?